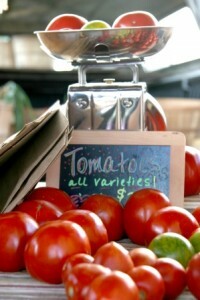 On the tables this week you will find… tomatoes!!! also… cabbage, broccoli, cauliflower, peas, beets, new potatoes, green beans, zucchini, yellow squash, kale, cucumbers, bell peppers, and Kenny’s CANDY onions. Blueberries are ready for picking, we should have some… at least for our “Basket of the Week”. Peaches are getting close, about a week or so for the first variety. Our weekly baskets are now available, be sure and pre-order by NOON Friday. Just a reminder, we have our homemade preserved items available along with Kenny’s beautiful We will be at the New Albany Farmer’s Market this Saturday morning, summer hours have begun 8:00-12:30. Be sure and stop by for your weekly fresh produce.